What are the best headphones for working out? In fact, there are a lot of horrible headphones out there. A good pair seems to be the exception rather than the norm. For this reason, we decided to create a resource for people looking for a good pair of headphones to use during workouts. In this article, you’ll discover our favorite exercise headphones, as well as what to look for before you make a purchase. There is one reason that the Bose SoundSport is sitting on a third position, rather than a first: the price. They are a great pair of headphones, it’s just that they’re slightly more expensive than I think they should be. This is pretty common for Bose headphones. They never quite live up to the price that they’re asking for them. They’re not a bad pair by any means, don’t get me wrong here. It’s just that they’re slightly overpriced. These headphones are wired, which brings a different set of pros and cons to the table, as we discussed above. You won’t have to think about battery life, which is a great relief to some people. The Jaybird Freedom Sprint is another great pair of in-ear monitors. They are lightweight, wireless, and come with inline microphone and controller. The weak point on the Sprint is the battery life. Sitting at around 4.5 hours, it definitely covers a workout session, but not much more than that. As you’ll recall, I recommend a battery life of around 6 hours for wireless headphones. The Sprint is very lightweight. You can hardly feel them resting in your ears, which really is quite convenient for long runs. Overall, they’re a good pair of headphones with a slightly low battery life. The fifth headphones on our list of the best headphones for working out are the Sol Republic Relays Sport. They are an additional wired option, for those who prefer it. The Relays are an exception to the rule: they don’t have any secure fit mechanism, but they do sit quite well inside the ears. This is because they have slightly longer ear tips than the other headphones, which turns the ear tips themselves into a semi-secure fit mechanism. They are a bit more difficult to get a good fit with, though, so I only recommend these if you don’t like any of the ones above. Other than that, they’ve got good sound quality, inline microphone and controller, and are quite durable. As it can be quite a difficult task to choose a pair of headphones, I’ve decided to add some additional options. I wholeheartedly recommend that you choose one of the headphones above, but if for some reason they are not the right headphones for you, you might be able to find a good fit here. First of all, these will be numbered, not ranked. I’ve already covered the multitude of considerations that come up when looking for the perfect set of headphones for working out. Using those, I’ll be making selections that address particular needs in their own exceptional ways. The only noise-cancelling available here is the “passive” kind. On the other hand, “passive noise cancellation” is how earplugs work. Squeezing a bit of latex into your ear remains an effective strategy for cancelling noise. The different sizes of ear tips provided should ensure a comfortable and stable fit while the back caps wind up being little more than a curious gimmick. Though, at this level, it’s nice to see a company wringing every bit of sound quality they can out of their design. Technology is amazing. These headphones are currently just five dollars more than the best wired pair I could find, yet already incorporate most of the best features of powered, wireless earbuds. This is a great example of how affordable wireless has become. The set was originally in the $100 range but is currently sitting at a lower price. With so many options available, the competition of the industry ensures that buyers have an ever-expanding collection of high-quality sets just begging for your money. Inoo Tech gives you a sweatproof pair of phones that gently mold to your inner and outer ear while delivering a remarkably broad audio range over a solid wireless connection. When one of the criticisms of your product is, “the noise-cancelling might be *too* effective,” you know you’re doing something right. A jump in price and a shift in form factor, Plantronics’ Backbeat gives one of the most secure fits you could hope for. I have to admit, I enjoy the wrap-around headphones. Having a sturdy bridge between each ear can take away some of the surprises of dangling cables. Though to be honest, it might just be the fact that the style was the first “cool” deviation from traditional headset design I saw when I was younger. Regardless, these headphones pack a punch with terrific sound quality in a durable, ergonomic package. I like having the controls on each ear, with little chance of fumbling or hitting the wrong button. Plus, they’re specifically tailored for outdoor use. Rather than overwhelming with noise-cancellation, these buds are designed to allow natural background noise in. Sure, you’re compromising an all-encompassing personal concert hall for a bit of safety, but the extra ventilation should actually reduce the chance of ordinary irritation from extended use. The penultimate entry is a wired wildcard, with a level of quality and price to justify the tether. To be clear, these are fully capable of underwater use (with a compatible player, of course.) However, considering how unpredictable the weather can be, these are perfect for any outdoor exercise. Getting caught in a downpour might be annoying, or exactly what you need. Having to worry about your headphones shouldn’t even be in the equation. It helps that these sound great, and provide enough ear tips that you may very well use different styles in each ear for a perfect fit. Back to the world of the wireless, we can see ever more evidence that cost is a poor determining factor in audio technology. Creating a reliable, ergonomic set of headphones with high-quality audio is entirely within the reach of even smaller companies, and AYL has shown this quality beautifully. Truly, this pair best represents what you could hope for in a new purchase. It has a wealth of tech features, including the ability to pair with *2* devices at once. They’ve got all the audio and control options you might want, and more importantly, they’re doing it at a price point that allows for accidents without the heartbreak. The Photive PH-BTE70 has everything that a good pair of exercise headphones requires. This is evident from the checklist. The fact that they’re lightweight and wireless makes them one of my absolute favorite in-ear monitors. They come with an around the ear hook that secures that they remain where we want them. Though it might look complicated to use, it is quite easy to get the hang of once you try it out. If it wasn’t for the horrible microphone, these would be the ideal pair for any exercise enthusiast. Luckily for me, I don’t take calls very often while I’m exercising, because these headphones have got everything else checked out at a very satisfactory level. Sitting at a close second place is the Skullcandy XTfree. These headphones have got all the features that we’re looking for as well. They’ve got good sound quality, secure fit technology, inline microphone and controller, and a battery life of around 6 hours. They are really quite similar to the Photive PH-BTE70. The reason that these are placed second, rather than first, is that the Photive has slightly better sound quality and the secure hooks are more reliable than the secure fit mechanism of the XTfree. Choosing between the XTfree and the PH-BTE70 basically comes down to personal preference. The XTfree has an extrovert design while the PH-BTE70 has a simple and sleek design. If the design is not what makes or breaks a pair of headphones for you, though, then the PH-BTE70 are the better workout headphones. These factors will be discussed in detail below. Get up and start moving, though, and those luxuries become liabilities. The large absorbent cushions will soak in sweat, creating a perfect ecosystem for ear/sinus infections. While the weight suddenly acts as an extra appendage on top of your head.If we’re talking about sitting in a beanbag chair, hooked up to your friend’s old-school turntable, comfort generally means a big set of cans on your ears. The point is, although a good set of headphones should absolutely work in any situation you need them,comfortfor our purposes will be about reducing form factor and having the headphones remain in/on our ears. It is absolutely vital that the headphones stay put during workouts. You’ve probably tried to exercise with a set of regular in-ear monitors. Having them remain in your ears during intense exercise is quite a challenge. For this reason, I recommend looking for a pair with some form of secure fit technology. Most of the top workout headphones do already have this box ticked, but it is definitely a factor to keep in mind. This point might seem obvious, but you’ll be surprised over how many headphones aren’t sweat resistant. This is one of the first things you should check when you’re looking for a new pair for working out. It doesn’t make much sense to spend your hard earned money on a set, only to have it destroyed because they were exposed to a bit of sweat. If you decide to go with a pair of wired headphones instead of a wireless pair, then make sure the cable is either tangle-free or tangle-resistant. Not only will they be faster to get out of the box and in you ears, but the cable won’t get tangled while you’re running or lifting a pair of dumbbells. To be able to take calls and change songs without grabbing your phone or music player every time is extremely convenient. As with any set of headphones, the sound quality is an important aspect. We want to listen tomusic while we are exercising. Notice that I said music, not just some white noise. 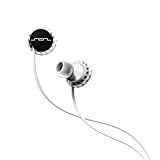 Fortunately, most of the best headphones for woking out do come with a good sound quality. One way to determine whether or not a particular pair has a satisfactory sound quality is to read a couple of reviews. Most of the time you’ll be able to find people saying that they enjoy the sound or even the opposite. When using a pair of headphones in your living room, chances are you’re not going to need noise isolation. Step inside a gym, though, and it’s a different story. Weights pounding, people stomping on the treadmill, or guys shouting at the bench press. The background noise that we’re already trying to escape might interfere with a comfortable listening. For this reason, a pair of headphones with either noise isolation or noise cancellation can do wonders. In my opinion, it is not always necessary to get a pair with active noise cancellation, but noise isolation is a must. Nevertheless, do keep in mind that if you’re running with traffic nearby, you must be able to hear the traffic. The majority of my broken headphones have played their last tunes at one single location. You probably already guessed the location, the gym. Somehow the gym seems to be the ideal place to get your headphones destroyed. This is why I always recommend getting a set that is durable. In my opinion, it is worth spending a little extra to ensure you get a strong and durable pair. It is, after all, cheaper than buying new headphones as often as I have in the past (Doh!). But how do you know whether or not a pair of headphones is durable? This is one of the most difficult aspects to check prior to a purchase. The best method I’ve come across is to simply read lots of reviews. If a set isn’t durable, you can be sure to find several people say that their headphones broke way to easily. The final category is the one that will probably be most prominent when actually making the purchase. 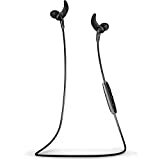 When you set out to look for a new pair of exercise headphones, you might be seeking something cheap with little to no fancy features, or something more expensive with the whole shebang. Again, this is where the endlessly-reviewed internet helps us out. Product pages are filled with the responses of your peers, alongside related products. Trails of links that have already been blazed by thousands of customers before you. Use them! Check the number of scores, and if it’s over even a hundred, you can start to develop some trust towards the star ratings represented. Groups of humans are really terrific at sifting this sort of information out, and shopping websites are capitalizing on that to great effect. A question that comes up a lot is whether wired or wireless headphones are better for working out. Unfortunately, there is no single answer to this question. It depends on your personal preferences. No cable to get tangled in. No heavy cable bouncing with every step. No need to keep the music source on your person. Must always check that they’re charged before you go to the gym. Requires your source to have Bluetooth. Reduces the power required of your source. Often have better sound quality. Cable can get stuck in exercising equipment. Cable can be quite heavy if no shirt clip is included. If the wireless option seems more promising to you, remember to check the battery life on the headphones. Anything below 6 hours is probably too low, in my opinion. Most people, when they think ofworkout headphones, think of in-ear headphones. This is understandable, as they are much more common. There are, however, quite a few good over-ear headphones out there. The difficulty with over-ear headphones, though, is that they require much more to be a good fit. Said another way, everything needs to be perfect for a pair of over-ear headphones to make good exercise headphones. Because of this, I tend to prefer in-ear headphones. After all, that’s the truth of a good pair of workout headphones. Accidents can happen anywhere, but exercise does seem to concentrate their potential. Before worrying too much about brands or styles, you should find a pair that provides options for adjustment, and will give you a solid performance for the life of the product. It should also be noted that every one of these options includes a microphone for making and receiving phone calls, and is a natural expectation when shopping yourself. You may notice, however, none of these headsets provide theft-aversion technology or “stomp-proof” casing designs. If you work out enough, you will eventually have to bid farewell to even your most cherished pair of spiritual motivators. When you do, and you’ve gotten over the heartbreak, I hope you’ll be more comfortable facing the wall of options available to you.